Incredible People: Martin Luther King, Jr. There was a “backlash” in the news, and even a “counter rally”. Accusations were tossed around of trying to co-opt the day… hogwash. The notion that Martin Luther King Jr. belongs to any one group of people is nearly flat-out denying the substance of all that he said. As I was listening to all this talk about MLK—who he was, what he thought, what he said, what he stood for—I decided that I really didn’t know a lot about him first hand, so, I began investigating. 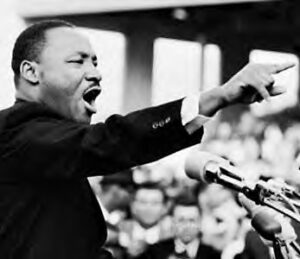 I began, of course, with his most famous speech, “I Have A Dream”. It’s famous for a reason. I found his speech online and we read it together as a family back in early September last year. It was shorter than I imagined, actually … but very to the point. The dream he spoke of was that one day there would be no colors, no division. One day, all of us would live together as equals. I think his courageous efforts to stand against injustice—leading other people to do the same—went a long way toward improving that in our country, but there are still so many “us” vs. “them” divisions (not necessarily, or at all, based on skin color) that sadly, I’d say we have a long way to go still. Perhaps we’ll never fully realize his dream this side of heaven, but it doesn’t hurt to keep trying, keep encouraging each other toward it. The text this speech can be found here, and I will quote most of it below, highlighting some of the spots we thought were the most interesting/thought-provoking/great. All men. I believe that the people who founded our country believed that. There are many stories and evidences to show that, though for hundreds of years there had been a culture of slavery that was more than abhorrent, many (perhaps most) did not support it, or even opposed it. But that’s not what I want to highlight here… I think it’s great that MLK was an American. Not an African-American, but an American… this was his “land”. And he took the words of our founders literally: That all men would be guaranteed—equally—these inalienable rights. I don’t think most of us today realize how important these two things are. We all live in relative freedom, purchased by many who have come before us. Perhaps many of us have known injustice. But in general, we think of riches more as material things rather than these more basic, more fundamental rights. This was an amazing paragraph. How strong is the dark power of bitterness and hatred. It clouds our judgment, fills our heart with darkness. It is definitely powerful, and in a bad way. King was right to acknowledge it, but emphasize that those who were perhaps justified in feeling it must not remain in it, or allow it to remain in them. In another speech King said, “So this morning, as I look into your eyes, and into the eyes of all of my brothers in Alabama and all over America and over the world, I say to you, ‘I love you. I would rather die than hate you.’ And I’m foolish enough to believe that through the power of this love somewhere, men of the most recalcitrant bent will be transformed.” He was right. Incredible people are definitely uniquely gifted by God in some ways, but more often, they are just regular people who believe in something, and whose convictions (and usually their deeply rooted faith in God) allow them—perhaps require them—to stand up for what is right. To do what is right. Martin Luther King, Jr. was another incredible person, and definitely worthy of a place of honor in our nation and around the world.